Adam Bhatti today posted two more short videos showing PES 2015, and unlike last time he didn't show any gameplay snippets. Both videos are about the new pre-match screen in PES 2015. While the basic structure of the menu appears unchanged, we can easily spot the much more slick look of the menus compared to PES 2014. This was one of the main changes made to the game by the Konami Windsor studio, which opened last year. 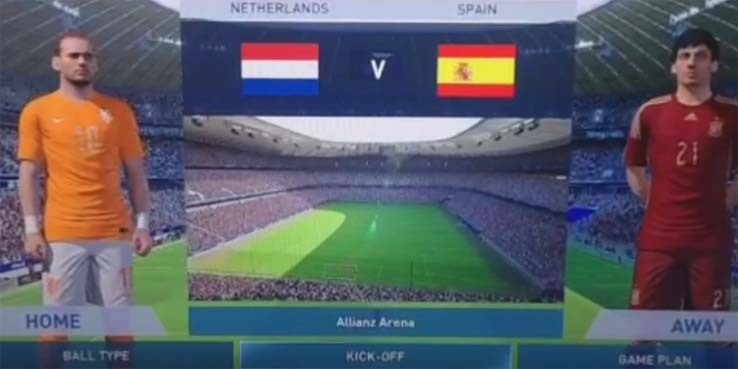 The first Vine shows Netherlands and Spain, while the second featurers Brazil and Portugal, so expect all these teams to be licensed in PES 2015, as well as Bayern München's Allianz Arena, which is also shown. PES 2015 will be on show at Gamescom from August 13 to 17, so expect lots of more announcement, screens and videos throughout the week.